I was very interested to see the new programs from the Russian Senior pairs at the test skates this past weekend. I can’t say I’ve liked a lot of the programs that have come out of the Russian school in the past few years (or ever) but one thing you can say is: you never know. You really could get The Addams Family; you could get Rachmaninoff; you could get anything. There aren’t many Russian teams competing at the Senior level this year and we didn’t get a lot of video posted online, so let’s take a look at what we did get. My first reaction to their new short program was, “How does this keep happening? How?” and then, “It’s gotta be them. That’s the only answer.” I was convinced this issue would be corrected after the debacle of last season. Now, the program isn’t terrible in say a Candy-Man way but it still has some cringe-worthy moments and it certainly does not suit them or show them in the best light. Even in their short program repertoire, which isn’t very impressive, it doesn’t win. (I think their “Glam” and Rachmaninoff programs are in a tie there.) I’m not a fan of pointing and hand shaking as a choreographic choice. The specific music choice is weird too because the track just seems so… noisy. What is all the banging and knocking in the background? It’s hard to listen to and seems kind of frantic. As my sister said, in a wonderful report card remark, “Overall it really doesn’t seem like the program of a team who understands why no one liked Candy Man.” You are exactly right, my dear. If the idea was to branch out a bit and show versatility, I think it was based on a fundamental misunderstanding of the problems the team has had with it’s material. I don’t think the best approach with this pair is to show that they are versatile because they aren’t and I think everyone has figured this out by now, everyone except they’re team, I guess. They aren’t performers. They can’t perform. They are skaters. They need programs that highlight their skating, that put it front and center and it’s so fast and so beautiful you are captivated by it and don’t care about anything else. Go Russian. Go Classical. Or go home. I like that you can hear (or not, I guess) how quiet their blades are at the beginning. I like the transitions. And I think they have really improved their lifts. I’m enjoying them much more anyway. I think this shows some of their lovely lines and they are absolutely fast. And an added bonus, the quad twist is a STUNNER. I’m so glad they are going for it! I think it’s the best one I’ve ever seen them do. Overall, while I don’t think the program entirely engaging, or at least won’t be until they are engaged, I do think it shows their skating to better advantage. Watching this, I didn’t start out on a good note with these guys because I was disappointed from the very beginning when I saw that they were wearing the costumes for their “La Strada” program from last year. Sure enough that’s what they are doing. It immediately made me wonder about who is making the choices here because if I kept any program from last year for this team, it would have been their short. It was good and it’s not like they competed it all over the place. It was a strong vehicle for them. But as the free program went on, I found myself enjoying it more than I thought I would. I think it has improved and that they can get even more mileage out of it. Maybe that’s what was behind this choice? Some programs you just need two years to skate it at it’s peak. I found it quite charming and it’s always nice to see that they both do perform but to really have an impact, they will need to skate it clean, so it can tell the story un-interrupted. So, maybe the reason for keeping this program was this: if they don’t have to deal with a new free program they have more time to deal with other issues. Because their are issues, lift issues. They really need to figure these lifts out. It’s hard being a fan when your team just isn’t coming through. But, it’s still early. Come on guys, you can do this! I don’t know what their short program is yet but based this picture, I’m guessing something rock or edgy or involving a strong bass and percussion. No skirts here! Maybe “Hunger Games”? Actually, this makes me hope for some stomp-stomping! Best moment in skating ever. I think this means that they are going to take over the world. That’s mostly what I have to say. Okay, a bit more. They are in Seniors and they are ready for it. I remember reading that Moskvina always wanted to create moments in her programs that she called “The Masterpiece” – these picture perfect moments. This program is just littered with them. They have been clearly taught to hold an edge and listen to the music. And they have such buoyant, positive energy that just spills over when they skate. This really seems like a partnership that works well. I do want to say, though, that I do not think the jacket is working and that they should re-think Dimitrii’s costume. Small notes. Really, this is my take: I think Moskvina’s fully invested here. She’s banking everything on this team. This is another repeat program and I am sure it was created last season with the intention of competing it in Senior, this season. Last season was the warm up. This is the real debut. Tarasova/Morozov need to watch out. Zabaijako/Enbert definitely do. And everybody else. This team is aiming for the top. Again, haven’t seen their short program. (Well, I saw video of a program in the summer that had some quirky music and purported to be their short program and probably was, but that was quite a while ago and who knows if this is the same thing?) think it’s going to be folksy? Or possibly a tango? I love trying to tell what’s going on just by the picture. They seem sort of cheeky here. Good lipstick. And can I say that I like when skaters come out in full costume, ready to go at the test skates? I don’t know how they did it but they managed to get a program just as wacky as their “Chicago” program from last season! I’m starting to see a real trend here – many music cuts, sort of frenetic energy, jarring changes of tone, stories from the 1920s. Afterwards, you say to yourself, “What just happened?” It’s like being on the Oompa-Loompa boat. When the phone started ringing, I nearly lost it. But at the same time, I was strangely fascinated by it all and really, I still do love these guys. They are still so cute and earnest and they are going for it. They are not just going through the motions. In terms of the program, they still have a long way to go. There is a lot they need to work on in terms of synchronization (I think but honestly, with this program, I’m not sure). His footwork in the lifts needs to be cleaned up and speed in general, I think, improved but particularly on the lifts. Still, the twist and throws are very good and they are being ambitious with their jump content (triple flips!). I don’t expect everything to work out for them this year but if they are committed to working on it, in a couple of years, it will all be there. Whether they same genius/crackpot is making their programs, I will have to wait and see! I don’t even know what to wish for! 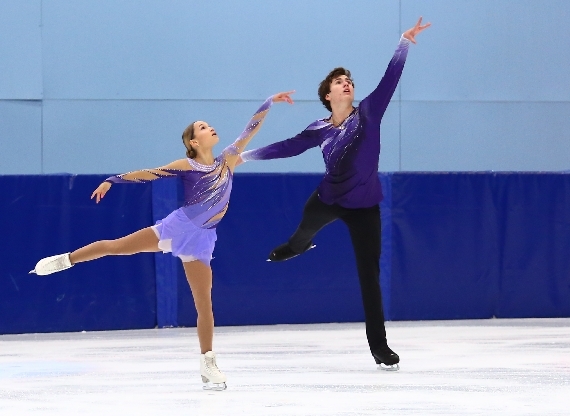 Again, no video of their short program but if I made a guess, I would say this is probably something sort of “Cloud Atlas”-y, like their short program from last season. It worked for them and I’m guessing, based on the free skate, that their team tried to keep the programs similar to last season. So, this is what we got of their free skate. Not much to go on. I don’t entirely understand why they just skated a portion of it. They were injured or something? It couldn’t have been much though because they just skated at Lombardia. Anyway, here’s my feedback based on this bit. They look smooth and fast. I like the black outfits. I sort of like the music. I like that they are going for drama but I worry that the music will overpower their skating. It’s not like they are known for their impact. I’m not sure about her hair cut. I would like to see it when it isn’t all slicked back. The slight variation in the lie-down lift is slightly better but still not enough. Not a great review – we will have to wait to see the full thing. This is all we get of their short program too, team of mystery! Again, not much to go on. I couldn’t even begin to speculate. But even if I did, I would never get it right. I finally saw it with Lombardia this weekend and well… let’ s just say I’ve never seen anything like it before. But we’ll have to save that for another day.